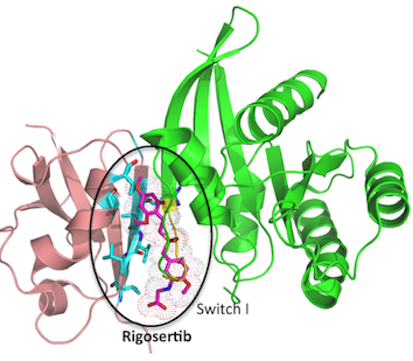 Model of rigosertib binding to the Ras Binding Domain (RBD) of C-RAF (pink ribbon) relative to the position of RAS (green ribbon), which is shown for comparison. Our laboratory is interested in the study of genes that govern cell homeostasis and how these controls are dysregulated during the neoplastic process. We use a combination of biochemical, molecular, synthetic chemical and structural biological approaches, and in close collaboration with the clinical community, develop and test small molecule anti-cancer compounds. Several of these agents are now in various phases of clinical trials. We are also interested in studying the role of oncogenes in normal development and tumorigenesis using genetically engineered animal models. Our analysis of conditional and traditional knock-out mouse models of the myb gene family have allowed us to define their roles in hematopoietic stem and progenitor cell development and maintenance as well as their role in the development of the mammary gland.